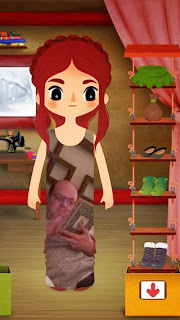 I hope my friend Josh doesn't mind me using this photo of a creation his daughter made in Toca Tailor. But besides being quite hilarious, I think this photo is so moving and says a lot about what it means to be a parent. And what it means is this: I will let you use my expensive phone as a toy so I can steal a few precious moments to read and during that time you will snap an unflattering photo of me (I'm not saying this is an unflattering photo of Josh) and incorporate it into the pattern of a dress on the very game I downloaded to amuse you. I love this image because while I can't say I have anything on my phone quite this magnificent, I have hundreds of Toca Salon and Toca Tailor snapshots along with a zillion photos of me looking down that I didn't know Ellen took. To me this photo of Josh represents how parents are completely powerless when it comes to the way they will be represented by their children in the future, in a work of art, or even just in how they live their lives. We'll be woven into everything they do. But we have no control over how they will remember us or portray us. We will have paid for the lessons, provided the materials, and encouraged them. And they might pick a weird image of us to make into a dress, as Lila has done here. I don't mean to imply that my children are anything but thoughtful and kind towards me. Because they really are. But this got me thinking about searching everywhere to find Sam a Doctor Who DVD set for Christmas one year and how excited I was when I found a used one because it's an expensive set. I thought about how I'm currently researching how to build your own arc reactor to help Ben make one for Halloween. I thought about researching adenoids and allergies before Sam had his tonsils removed. I know that when my children go on missions or to college I will become a "band wagon" fan of whatever they do and wherever they go. I want to tell them, "Can't you see? Don't you know? Isn't it obvious?" Everything I am, everything I'm into is for and about them. Oh, mom. You got so into diapers and pacifiers and healthy food and teaching your children when you had kids. You just jumped right on the band wagon like some kind of dork with no life. Dork with no life, indeed. Last week at church my neighbor shared the pain she is feeling for her sister who has a son who is making some bad choices right now. She didn't say what her nephew is doing. Probably partying or ditching school or breaking his mom's heart in one way or another. She was really sad for her sister. She cried. And I almost cried. And I'm sure her sister, this mother of a wayward son, has cried. And I thought to myself, this boy has no idea. He has no idea how much people care about him. He has no idea that choices he makes could make his aunt cry. Do you know how often I think about my aunts? Almost never. And if I were about to do something dumb or crazy I would not think about them, for sure. And here we are on the other side of it caring so much about this kid and hoping the best for him. He would probably make fun of us. Dorks with no lives! I mean, I would. So true. I've been thinking about this, too, how our kids just have no idea how our world revolves around them and everything we do is for them. I sure didn't understand that about my parents...and still don't. I like this post so much. Thanks, thanks. My son was mad today that he got out of school for an hour or so to go to a dental checkup. I'll admit, I got mad right back. Doesn't he realize how loved he is? How we spend our time and money to keep him healthy so he'll have his teeth, and the rest of himself, when he's 80? He has no idea how lucky and loved he is. Instead he's going to be mad that he missed recess. this is a great post, and you are a great and cool mom. your approach reminds me a lot of my sisters' approaches (the ones with older kids at least), unless there is some other reason to explain why bonny and phoebe are REALLY into american girl dolls in their 30s and 40s. i also wish i had a teenage son to justify my being (apparently) a bandwagon doctor who fan. i actually have you to thank for that because i pretty much read every book and watch every show you write about on your blog (i don't think i can stomach breaking bad, though). though i'm definitely more of a david tennant fan than a matt smith fan, but everyone says i'll come around soon enough. "Could be there’s nothing else in our lives so critical as this little home." I've listened to this song so many times and never thought about it this way. I loved this post. "Can't you see? Don't you know? Isn't it obvious?" Almost made me cry. I've had "here we are on the other side of it, caring so much . . . " running through my head all weekend. It's so true. Thank-you! Never commented before, but I really love everything you write. I always think, "Yep! That's exactly how I feel! How did she know how to put that in words?" This one almost made me cry for some reason. I honestly never knew about how much research would go into mothering! I was nodding my head with each paragraph. Loved your thoughts! This popped up on the sidebar when I read your blog about hugging. So I read it again, like I do every few months. And it made me cry. Like it does every few months. Man. Parenting. It's the worst. And the best. Ugh. I read it again and it's even more cry-inducing now. Bright side: This is how all parents feel. We're all in it together at least?